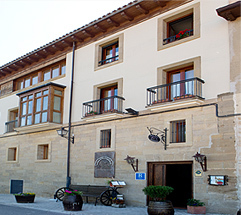 Los Calaos de Briones Restaurant offers a full menu based on the most emblematic dishes of traditional La Rioja prepared in an innovative way. 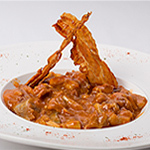 Market cuisine, subject to seasonality, in which premium quality products prevail. A fascinating room in a XVII-century "calao"
Enjoying such a unique room, located in a seventeenth-century cellar is only possible in the town of Briones, La Rioja. With capacity for more than sixty guests per room, all kinds of events and group meals can be held here. The visit to Briones, declared a historical and artistic site, is highly recommendable. It boasts a medieval urban fabric with multiple buildings of interest. Their environment, a landscape of vineyards flanking the Ebro at the foot of Sierra Cantabria, is spectacular all year round. 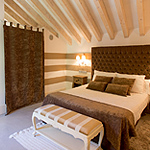 We invite you to our rural charming hotel near the restaurant, in Briones city centre. 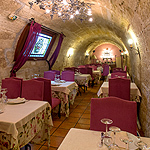 Built on an old winery, which still retains its “calado” or cave cellar, this charming hotel offers twelve rooms with bathroom, lounge and dining room, and reading room. 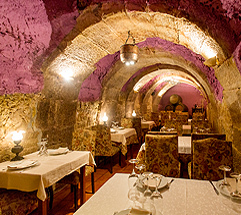 Los Calaos de Briones restaurant is a special place where diners can enjoy traditional cuisine with innovative and current flourishes in a unique setting, with seventeenth-century wine cellars retaining all the charm and flavour of traditional winemaking. Nuria and Gerard, both natives of the town of Briones, are the couple that manage this restaurant in addition to leading in the kitchen and the dining room respectively. 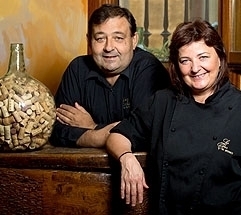 Lovers of La Rioja gastronomy and culture, they decided to abandon their previous professions to take a chance on this project, their life´s dream, in 2004.